I read a story once about how to catch wild hogs. You bait them with food and, once they get comfortable and show up to eat consistently, you build one side of a pen. The hogs will stay away for a few days but the easy groceries will bring them back again. Then you build the second side of the pen. If you keep that up until the pen is built and the hogs enter through the open gate to eat, all you have to do then is close the gate. The television broadcast industry was scheduled to change over from analog to digital Feb. 17, 2009. The switch has been delayed indefinitely for reasons that vary depending upon the source and interpretation of source information. Regardless, we have seen the marketplace expansion of interest in "High Definition (HD) TV" and consumers’ appreciation for the new generation of television technology increase dramatically in recent years. To the majority of the TV watching public, the switch to HDTV is just another step in the process of replacing outdated analog systems with digital technology that offers greater image and sound reproduction compatible with modern electronic digital media players. But better sound and a clearer picture is just the beginning. The evidence shows that HD technology can also be used to remotely gain complete control over the thoughts, emotions and actions of people who will have no power to resist. The power that could potentially be wielded by those capable of remotely controlling people’s thoughts and actions is virtually limitless. An "experiment" of what can happen when large numbers of humans are subjected to remote control was successful in 1990 and witnessed by the whole world when Iraqi troops began surrendering to coalition forces. Newsweek magazine reported July 30, 1990, that the U.S. military successfully deployed "Silent Sounds" through the FM frequency radio band used by the Iraqi army after Saddam’s military communications system had been destroyed by coalition forces. "According to statements made by captured and deserting Iraqi soldiers….the most devastating and demoralizing programming was the first known military use of the new, high-tech type of subliminal messages referred to as ‘ultra-high-frequency silent sounds’ or ‘silent subliminals,’" Newsweek reported. Once system-wide conversion to HDTV is made, the silent sounds that neutralized the Iraqi army can be planted into the minds of Americans enjoying the crisper images and richer sounds of digitized TV. Through HDTV, "Big Brother" will be able to order troops to invade the homes of America and begin seizing weapons, food, valuables and maybe even children while our people are absolutely paralyzed for no apparent reason and can do nothing to defend themselves, their families and their homes. The desire to remotely control animals and people goes back as far as the desire to remotely control machines and for the same reasons. The New York Times reported May 17, 1965, that Dr. Jose Delgado of the Yale University School of Medicine had remotely taken control of a fighting bull with silent sounds during an experiment conducted the previous year in Cordoba, Spain. "Afternoon sunlight poured over the high wooden barriers into the [bullfighting] ring, as the brave bull bore down on the unarmed matador, a scientist who had never faced a fighting bull. But the charging animal’s horn never reached the man behind the heavy red cape. Moments before that could happen, Dr. Delgado pressed a button on a small radio transmitter in his hand and the bull braked to a halt. Then he pressed another button on the transmitter, and the bull obediently turned to the right and trotted away. The bull was obeying commands in his brain that were being called forth by electrical stimulation by the radio signals to certain regions in which fine wires had been painlessly planted the day before," wrote John A. Osmundsen of The New York Times. According to Dr. Delgado, experiments of this type had also been performed on humans. While giving a lecture on the Brain in 1965, Dr. Delgado said, "Science has developed a new methodology for the study and control of cerebral function in animals and humans." In another experiment, Dr. Delgado was able to compel a cat to lick its fur, and then continue compulsively licking the floor and bars of its cage. In yet another experiment, Dr. Delgado delivered a signal designed to stimulate a portion of a monkey’s thalamus, a major midbrain center for integrating muscle movements and was able to trigger a complex reaction: The monkey walked to one side of the cage, then the other, then climbed to the rear ceiling, then back down. The animal performed this same activity as many times as it was stimulated with the signal, up to 60 times an hour. But the monkey’s actions were not performed blindly—the creature was still able to avoid obstacles and threats from the dominant male while carrying out the electrical imperative. Another type of signal has made monkeys turn their heads, or smile, no matter what else they were doing, up to 20,000 times in two weeks. As Delgado concluded, "The animals looked like electronic toys." Since Dr. Delgado’s comparatively crude experiments over 30 and 40 years ago, a complete record of the advances being made in the field of remotely controlling other living beings has been published in the scientific literature—and in the U.S. Patent Office. US PATENT # 4,858,612, issued to Philip Stocklin Dec. 19, 1983, is "For direct transmission of sound into the human auditory cortex [a section of the brain]." The abstract basically explains that ears are no longer necessary because words can be implanted directly into your brain. This is called "synthetic telepathy." US Patent #5,159,703 which describes the "Silent Sound Spread Spectrum (SSSS)," was developed for military use by Dr. Oliver Lowery of Norcross, Georgia and granted on Oct. 27, 1992. SSSS, or "S-Quad," is described in the abstract as, "A silent communications system in which nonaural carriers, in the very low (ELF) or very high audio-frequency (VHF) range or in the adjacent ultrasonic frequency spectrum, are amplitude—or frequency—modulated with the desired intelligence and propagated acoustically or vibrationally, for inducement into the brain, typically through the use of loudspeakers, earphones, or piezoelectric transducers. The modulated carriers may be transmitted directly in real time or may be conveniently recorded and stored on mechanical, magnetic, or optical media for delayed or repeated transmission to the listener." In layman’s terms, this device, this "Sound of Silence" simply allows for the unwarranted implantation of specific thoughts, emotions and even prescribed physical actions into unsuspecting human beings. It has recently been decided on a global scale to eliminate the standard analog television broadcasts and convert to digital only. Why? If SSSS was being broadcast through traditional televisions via the analog system, it would show up as static on our stations and, therefore, be detectable. Once SSSS is delivered digitally through HDTV, no one will notice. Wireless digital technology is the cheapest, most effective way to transmit electromagnetic frequencies to your brain because there is significantly less infrastructure to maintain and much of it has already been built to meet ever-growing consumer demand for wireless communications and entertainment. People who convert to HDTV and get their fair share of digitally-enhanced "programming," will be most vulnerable to SSSS suggestion. However, throwing away your TV or declining to convert will not fully protect you from the silent sounds because their signals will be ambient in the air and our brain receptors will serve as antenna. Even instincts and emotions can be changed. In another study by Dr. Delgado, a mother giving continuous care to her baby suddenly pushed the infant away whenever the signal was given. Dr. Eldon Byrd. From 1980 to 1983, Dr. Eldon Byrd ran the Marine Corps Nonlethal Electromagnetic Weapons project. He conducted most of his research at the Armed Forces Radiobiology Research Institute in Bethesda, Md. During this time, Dr. Byrd stated, "We were looking at electrical activity in the brain and how to influence it…"
By using very low frequency electromagnetic radiation—the waves way below radio frequencies on the electromagnetic spectrum—Dr. Byrd found he could induce the brain to release behavior-regulating chemicals. "We could put animals into a stupor" by hitting them with these very low frequencies. "We got chick brains—in vitro—to dump 80 percent of the natural opioids in their brains," Dr. Byrd said. Dr. Byrd reported that he even ran a small project using magnetic fields to cause certain brain cells in rats to release histamine. In humans, this would cause instant flulike symptoms and produce nausea. "These fields were extremely weak. They were undetectable. The effects were nonlethal and reversible. You could disable a person temporarily. It [would have been] like a stun gun," Dr. Byrd noted. Dr. Stephen Aftergood. Director of the Project on Government Secrecy, Dr. Stephen Aftergood with the Federation of American Scientists said during a CNN interview with David Mattingly on the American Edge Show on June 18, 1997, "The idea that electro-magnetic energy can be used against people and not just against other weapons or electronic systems, is current; it is understood that this is an option and it makes the surprising claim that a psychophysical effect on people is possible for the purpose of altering their behavior, and even controlling the social aims of regional or even global societies. The fact is that today the United States is spending as much money on developing psychophysical weapons as on the most complex space programs." Studies conducted around the world have, for decades, been documenting otherwise unexplainably elevated rates of suicides and cancers in geographical areas. These areas have been found to be naturally enveloped in electromagnetic fields emitting frequencies detrimental to human health and well-being. The phenomena, commonly referred to as "geopathic stress," has been understood in scientific circles since ancient times. The effects of biologically-detrimental electromagnetic fields naturally emanating from the ground are associated with people experiencing chronic fatigue, headaches and migraines, depression, insomnia, anxiety or anger. We now live in a time where the artificial creation and amplification of the naturally-occurring phenomena of biologically-compromising energy fields has been weaponized. Dr. Robert J. Bunker of California State University at San Bernardino is an "unconventional war" expert and the editor of the "INSS Occasional Paper," 15 USAF Institute for National Security Studies, USAF Academy, Colorado. In his article, "Electromagnetic, High Power Microwave [HPM] Weapons," Dr. Bunker wrote that HPMs can also cause human unconsciousness without permanent maiming by upsetting the neural pathways in the brain or they can be made lethal. Evidence that testing of silent sounds is ongoing was noted in an Associated Press article published shortly after Gulf War II began. Associated Press—U.S. and British forces streamed in a long line of tanks and armored vehicles toward Basra, Iraq’s second largest city, on Saturday, a day after they collected underfed and overwhelmed Iraqi soldiers who surrendered in droves. An entire Iraqi division, the 51st Infantry, gave up to U.S. troops Friday, military officials said. A key unit for Basra’s defense with 8,000 men and up to 200 tanks, it was the largest defection in a day when Saddam Hussein’s forces showed signs of crumbling. Saturday morning, American Marines and British troops rumbled along the main road from the Kuwaiti border to Basra, Highway 80—nicknamed the "Highway of Death" during the 1991 Gulf War when U.S. airstrikes wiped out an Iraqi military convoy along it. At the Kuwait border, hundreds of tanks, armored personnel carriers, Humvees and trucks were lined up Saturday in a desert muddied by overnight rain, waiting in columns to pass into Iraq. It resembled a great train yard in the desert--some lines 70 vehicles long, others 50 long. The implication here is that the Iraqi soldiers had, themselves, partially disassembled their weapons before surrendering them. Since there is no known incident in the history of war where soldiers had attempted to render their weapons inoperable before surrendering them, one can assume that these soldiers responded to a silent order to do so. Our bodies operate fully on the signals received from our brains. Our brains operate on electrochemical impulses. These electrochemical impulses have been completely mapped by science. Scientists now can replace amputated limbs with "robotic" ones that respond to nerve impulses like the original body part. There is no question that the same science can be adapted to remotely make puppets of people. Dr. Saul B. Sells was a professor of social psychology at Texas Christian University (TCU) from 1958 until his retirement in 1983. In 1959, Dr. Sells submitted a proposal to the Central Intelligence Agency (CIA) to build the most sophisticated electroencephalography machine that would have an integral computational capacity to analyze and, hopefully, make sense of the brain waves it recorded. In other words, the professor proposed to make a machine that could tell the CIA what a person was thinking and whether or not the person wished to disclose that information. The CIA approved the project in 1960, adding additional research and outlined five objectives. The fifth objective of his department’s research was to explore, "Techniques for Activating the Human Organism by Remote Electronic Means." In 1962 Dr. Sell founded the Institute for Behavioral Research at TCU. 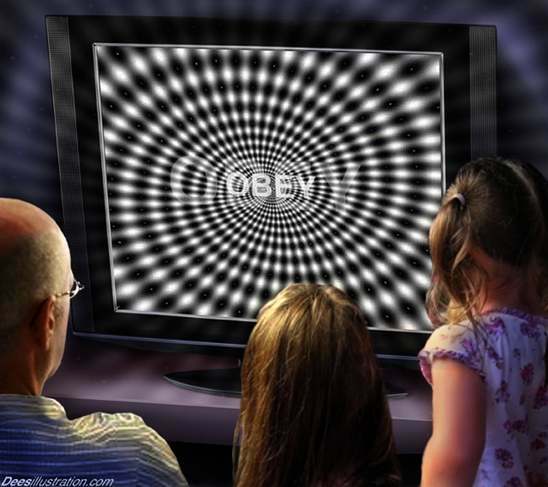 The coming conversion to HDTV has been orchestrated to free the airwaves for the potential puppeting of mankind. It is difficult to imagine any other reason why the government would be so concerned about our television viewing habits. When government can dictate every thought, every emotion and every movement in each member of society, we all become electronic toys remotely controllable for political and commercial purposes. Note: The importance of this article cannot be overstated. Television is about to take on a whole new dimension and people need to be aware of the power that will be in the hands of a few when the switch from analog to HDTV is made.